Retail therapy is a beautiful thing! Just the other week I had the pleasure of shopping with my mother-in-law and Grandma at some swanky mall in Columbus, OH. This mall was the real deal- stores were inside, stores were outside, up, down and sideways too! Dresses, jewelry and shoes were included in the bounty I collected (ahem…bought) and I have no regrets! 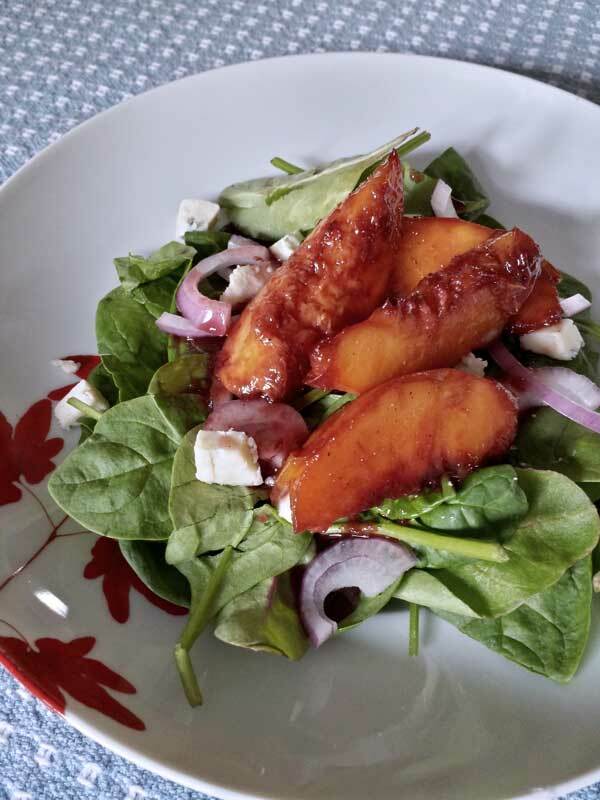 The one treasure we did find shopping was a beautifully dressed salad topped with caramelized peaches. We had to stop for sustenance…plus some members of our party were getting “Hangry” …if you know what I mean. But seriously…this salad looked so delicious that I thought I would try creating my own version at home which coordinated perfectly with the Green Bean Corn Pasta! Set the peaches aside till you are ready to use them. 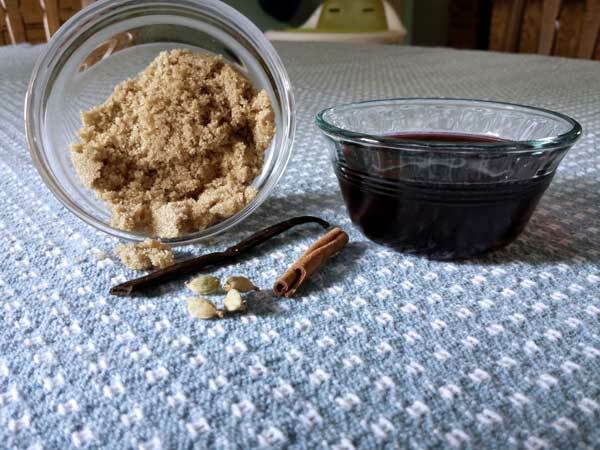 Make the syrup by combining some wine, sugar, cardamom pods, a cinnamon stick and a vanilla bean in a medium sauce pan over medium high heat. Continue to stir frequently so that the sugar dissolves and the mixture comes to a boil. Allow it to boil for about 3 minutes. It’s going to get slightly syrupy as it cooks down. Toss in your peaches (gently) and stir to coat each slice evenly. Continue to cook the mixture with the peaches for about 3 to 4 minutes. This is going to turn the peaches a nice golden color. When the cooking is completed, toss the whole spices and pour mixture into a glass bowl. These peaches have a plethora of uses, but today we are going to use them as our salad topper. Toss together any mixed greens you desire with sliced onions and dried cranberries. Top with the caramelized peaches and sprinkle with a tasty garnish of gorgonzola. A fancy salad dressed to impress any dinner party…or family member for that matter. 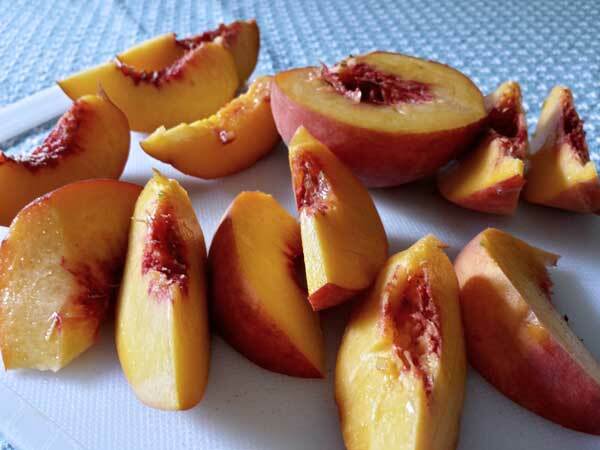 The peaches are luscious, sweet and spicy (not hot spicy…like spices spicy). The salad adds a delightful savory element to the dish and the garnish of gorgonzola adds the perfect salty note to balance the flavors. Do you have a favorite salad combo? I would love to hear your thoughts as I brainstorm more ideas for pasta night! 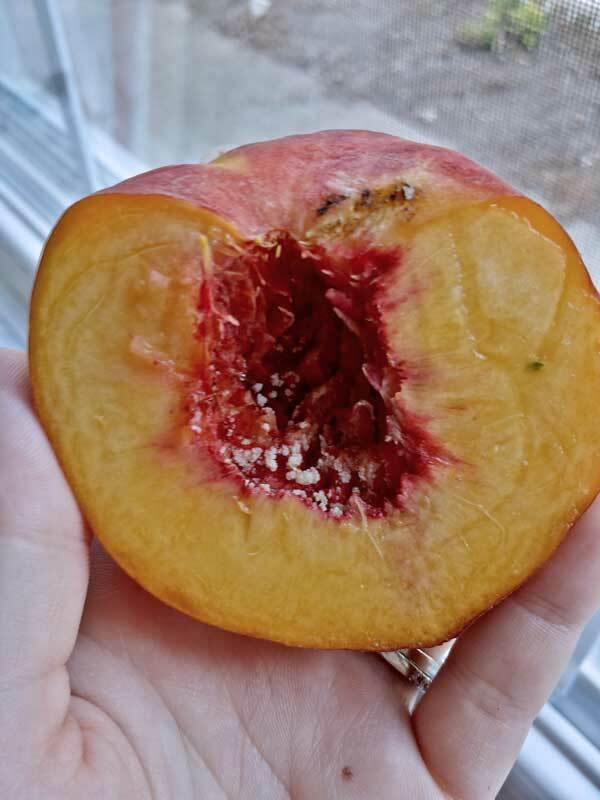 Cut the peaches in half and remove the pits. Then cut each half into quarters. 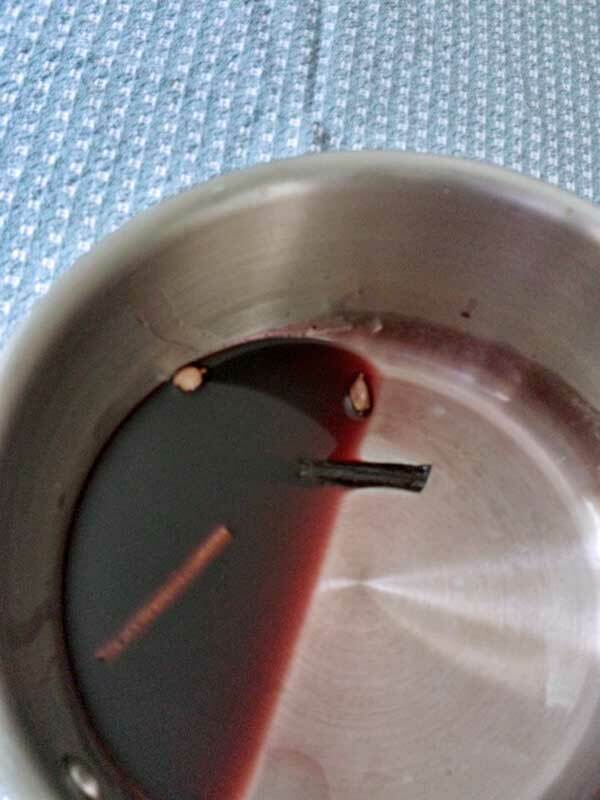 In a medium sauce pan over medium high heat combine the wine, sugar, cardamom pods, vanilla and cinnamon stick. Stir till sugar is dissolved. Bring the mixture to a boil and cook until the mixture becomes slightly syrupy. This will take about 3 minutes. Toss in the peaches, making sure that each piece is coated with the syrup. 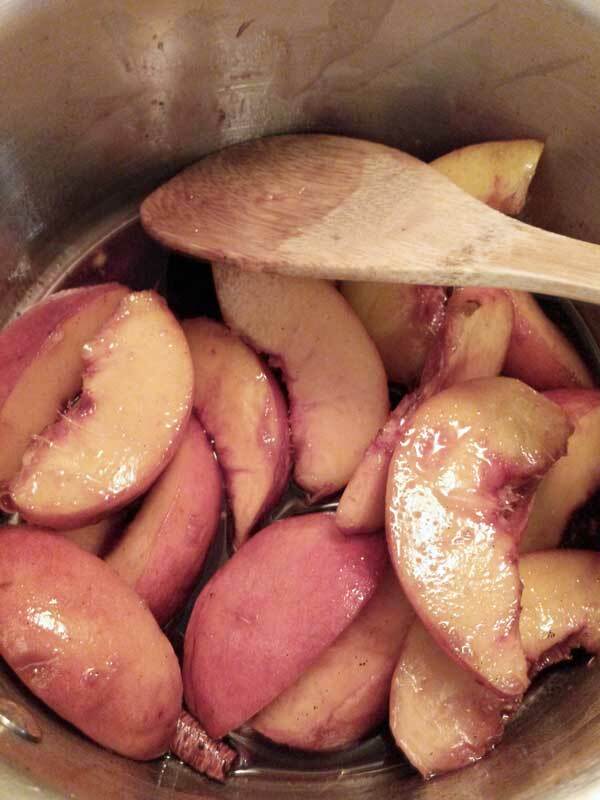 Cook until the peaches are evenly coated and turn golden in color about 3 to 4 minutes. Discard the whole spices and serve the peaches warm or cold. Toss the greens, red onion and dried cranberries together in a large bowl. 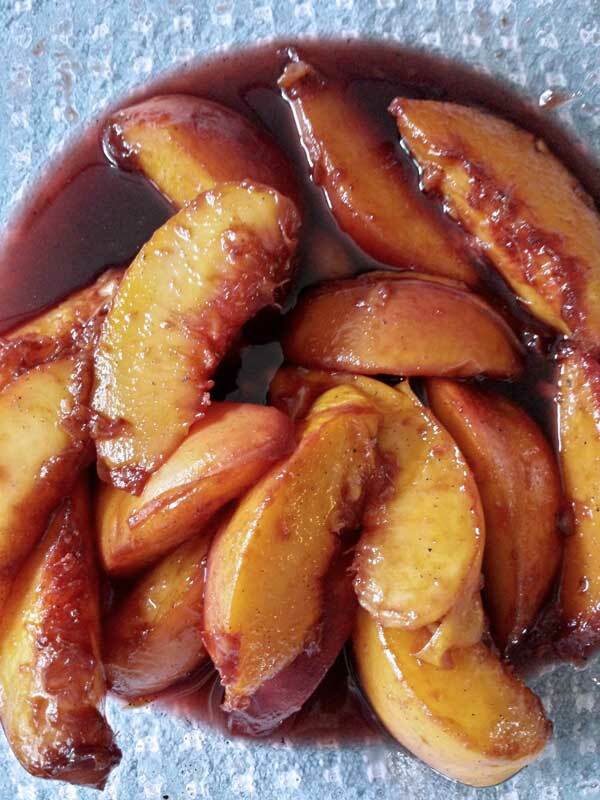 Top with the Caramelized peaches as well as the syrup. Sprinkle with the gorgonzola cheese. Serve immediately.